This topic contains 8 replies, has 5 voices, and was last updated by GarySFBCN 5 years, 9 months ago. The remaining flats will go on the market at a lower price with Sareb saying it is willing to listen to any proposals. Considering that building dwarves the other skyscrapers, it must be huge! 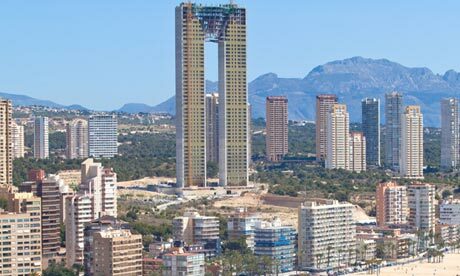 There was a lot of madness in the Spanish property boom, but building another skyscraper in Benidorm was not really mad per se. The problem with this building was the timing and cost: If they had got it away at the start of the boom it would have been fine. I drove past Benedorm recently and you can see that building from miles away. It has still got the cranes on top of it, although it looks like the structure must be nearly complete. I’d have thought that one of the flats at the top might make a good investment if you could get it cheap. However in these types of development I think it’s usually the developer and their mates who reserve all the penthouses for themselves, and I suspect it is they who make up a large part of those 80 existing flat owners. They say 80 owners but surely no one will have been crazy enough to complete on an unfinished building 😕 4 years behind schedule, wonder why they didn’t invoke the bank aval and get their money back! I doubt if you could complete on an unfinished building – don’t they need to be signed off as ompleted by the council before they release the escrituras? I guess the “owners” they refer to in the article are simply people who have rights to take ownership on completion, maybe having already made a few “down payments”. And those people might be in quite a strong position right now – especially if they have the rights to the penthouses on Europe’s tallest building (even though it’s in Benedorm). A follow up article that suggests 10 greatest white elephants of all time. Interesting to see the Empire State Building in there – apparently it took many years before it started to make money and even today 30% is left empty. About 8 years ago, the 20-something daughter of some mid-level government employee in Madrid was bragging about the flat that her father gave to her, which was a gift/obligation to him from a developer. It would be interesting to know how many corrupt government officials have “In Tempo” flats.